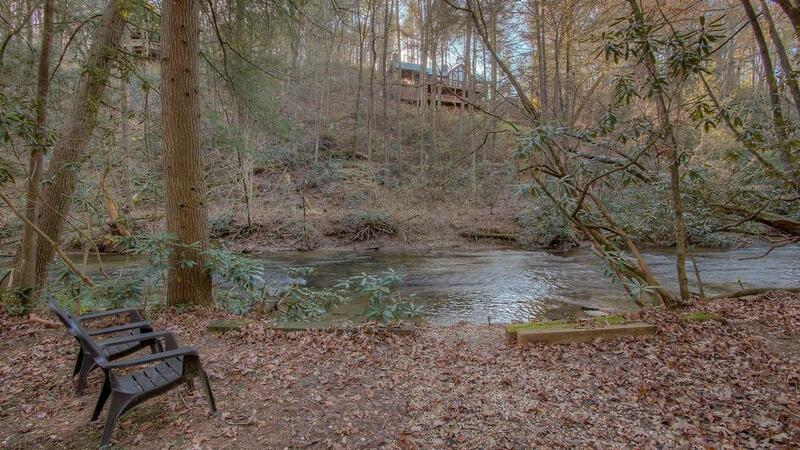 Nestled on the wooded banks of the popular Fightingtown Creek, River Rush Cabin is a perfect choice for your next North Georgia mountain getaway. 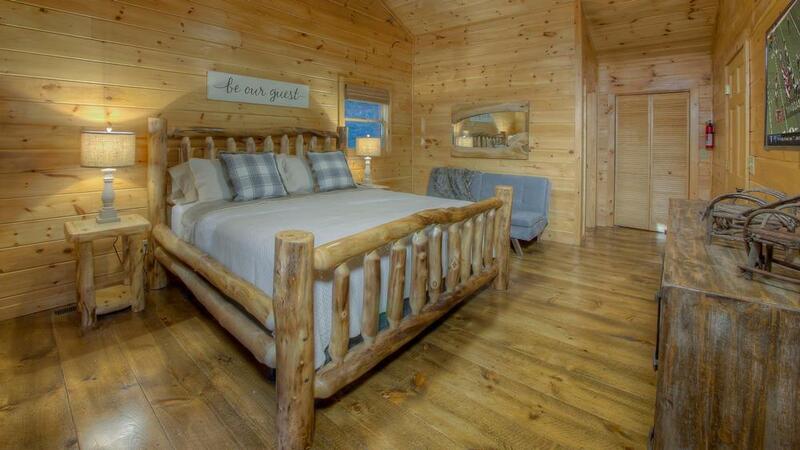 This professionally decorated cabin has every amenity you will need, and is uniquely situated on a backyard beach that makes it easy to access the wide, whitewater creek where you can enjoy floating, swimming and world-class trout fishing. 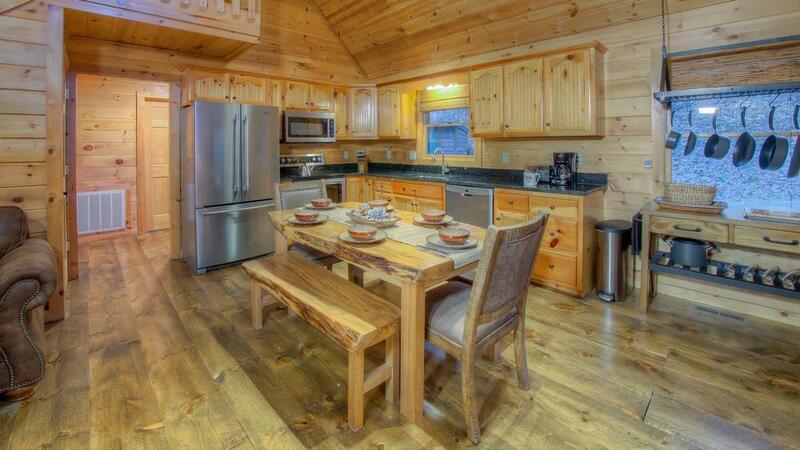 The natural treehouse setting of the cabin is nicely complemented by the convenient location - only 5 miles away from dining and shopping in quaint downtown Blue Ridge. Every detail was carefully considered when creating this serene hideaway so you can effortlessly relax and take pleasure in the sights and sounds of the nature that surrounds you. 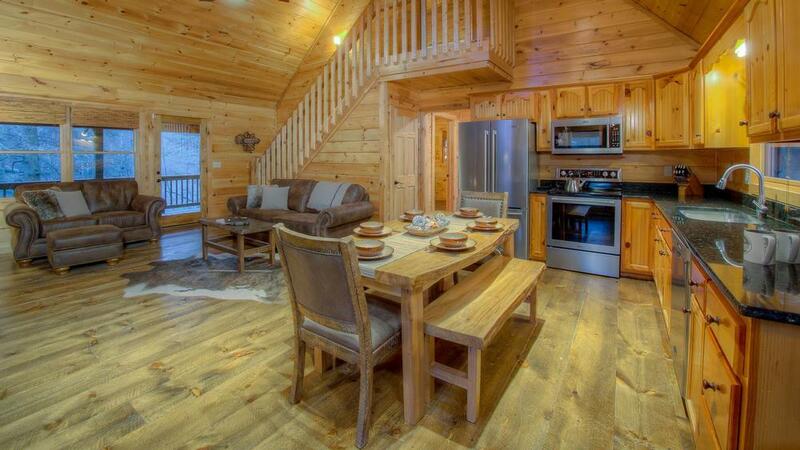 Upon entering River Rush, you are immediately welcomed by the beautiful natural pine interior, warm wide-plank wood floors, soaring ceilings and modern rustic details. The bright, airy open floor plan of the main level allows all guests plenty of space to enjoy each other’s company and is equipped with Amazon Echo for voice-activated music and info. Whip up your favorite culinary treat in the finely-appointed kitchen, which boasts beautiful granite countertops, an additional kitchen work table, stainless steel appliances and a farmhouse-style sink to make clean up a breeze. Adjacent to the kitchen is a dramatic wood dining table with benches that provides plenty of room to enjoy your signature dish. 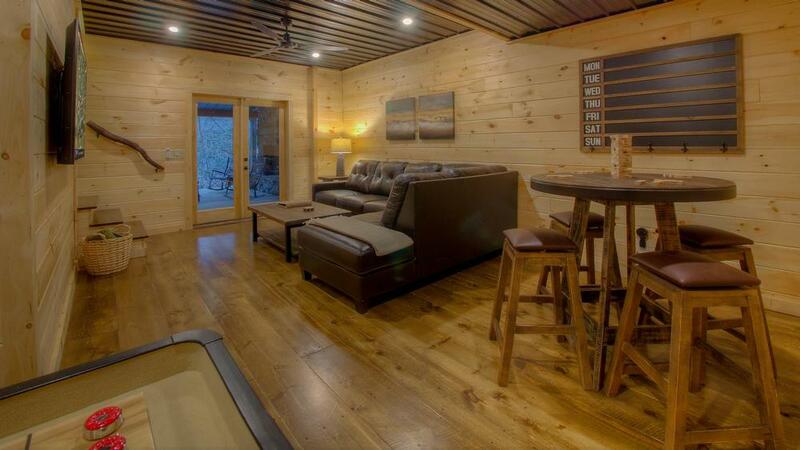 The family room with cowhide rug completes the open area, where you can curl up on the leather sofa or loveseat next to the impressive stacked stone gas fireplace and watch your favorite show on the flat screen TV mounted above the live edge wooden mantel. 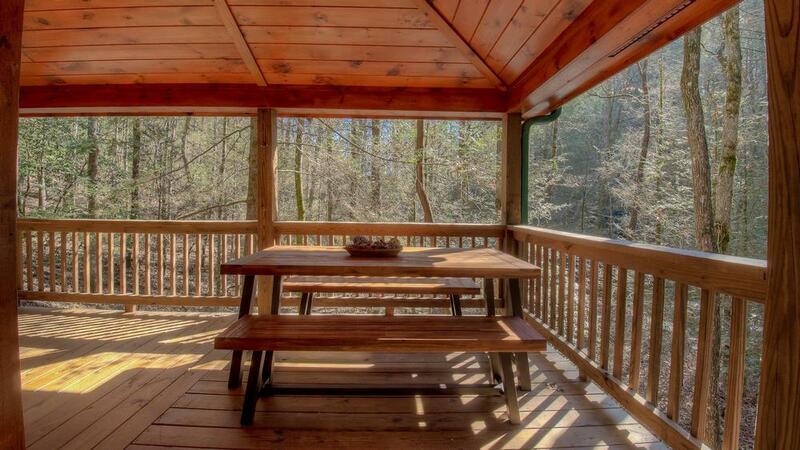 Walk out onto the wrap around deck, equipped with a gas grill and picnic table for cooking and dining al fresco and an array of comfy seats to lounge in. Grasp the unique laurel branch railing and descend downstairs to the lower level of the cabin where a rich leather sectional beckons everyone into the game room. 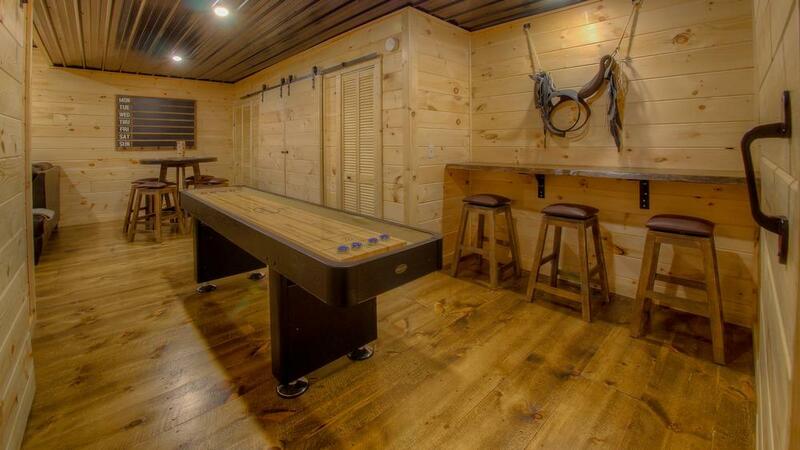 You can watch a movie or the game on the 65” flat screen TV, stage an epic competition on the regulation-sized shuffleboard table, play a game on the pub-style game table or sip a beverage at the live edge bar. 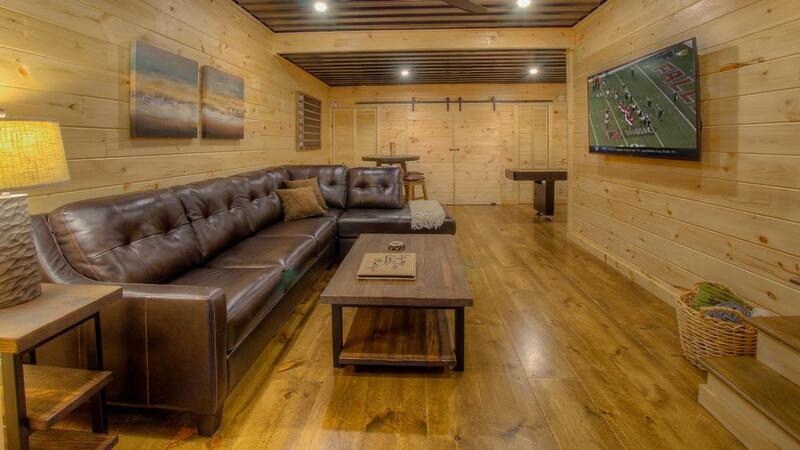 Rustic wood, hand-crafted barn doors and black metal ceilings give the lower level a stylish, modern feel. 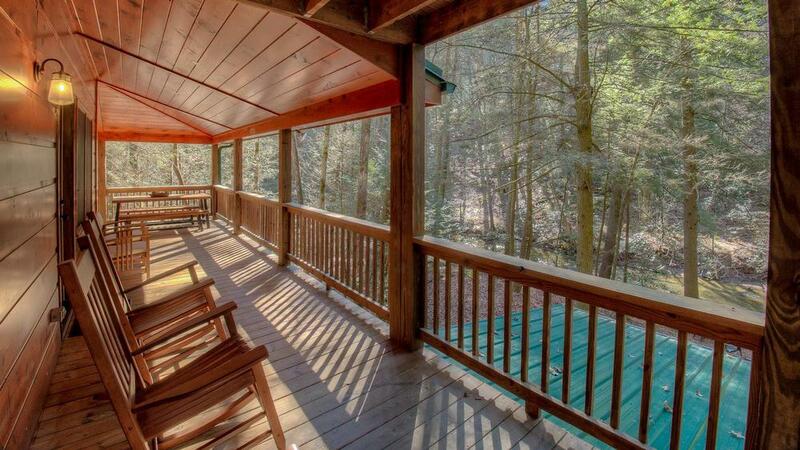 Step through the French doors out to the covered lower deck and experience what life on the creek in the mountains is all about. 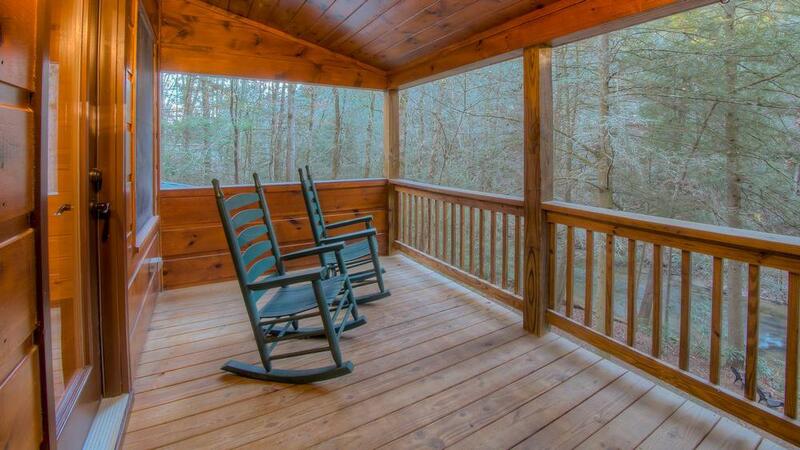 Grab a seat on one of the wide Amish hickory and oak rocking chairs that surrounds the large stacked stone wood-burning fireplace and listen to the peaceful sounds of the creek as it flows by. 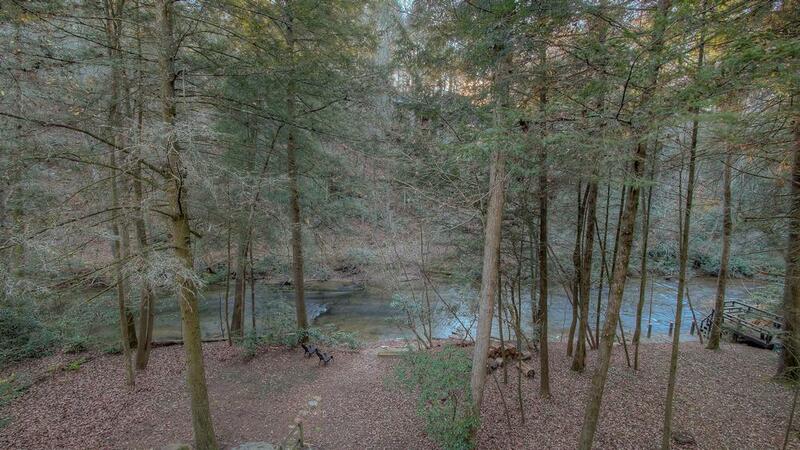 Take a few steps down the natural stone steps and past the flat, wooded yard and you are at the creek’s edge, where you can fish for rainbow trout, search for Indian arrowheads, or just splash around in the refreshing waters. 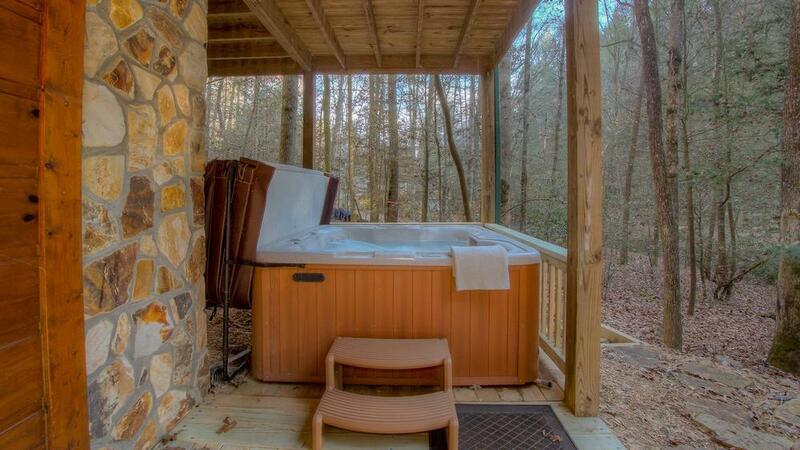 Rejuvenate back on the deck in the steamy, bubbling hot tub as you recall the day’s adventures. 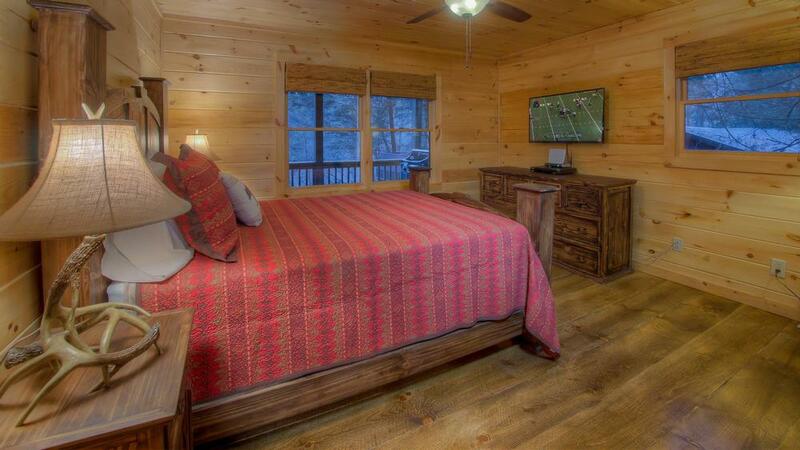 When it is time to call it a day, you can choose from one of the three naturally-themed and tastefully decorated bedrooms to retire in, all equipped with flat screen TV’s. The spacious but cozy master suite upstairs features lofty ceilings, a massive log king bed with matching furniture, large closet, eye-catching teak wood mirror, chic gray suede futon couch, and private covered deck as well as a magnificent ensuite bath with a custom live edge wood counter, convenient under-mounted sink and stunning silver quartzite stone walk-in shower and floors. 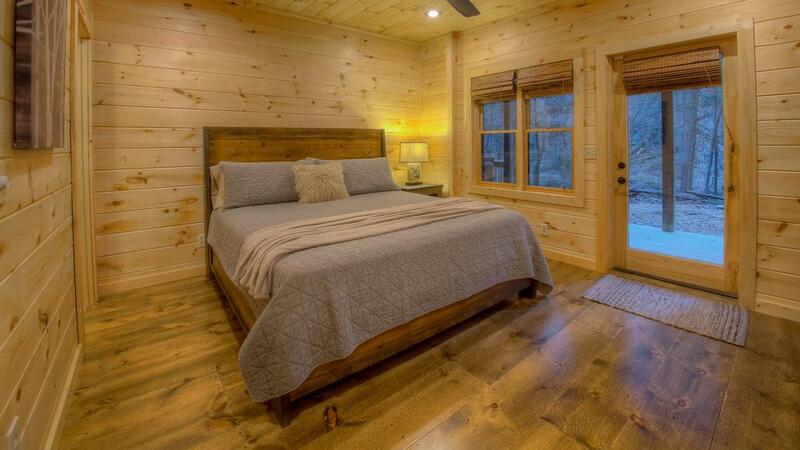 There is a second king bed on the lower level where the bedroom offers a hidden twin trundle bed for that extra guest, adjoining bath with a walk-in shower crafted with the same striking stone as the master, and private access out to the inviting hot tub. 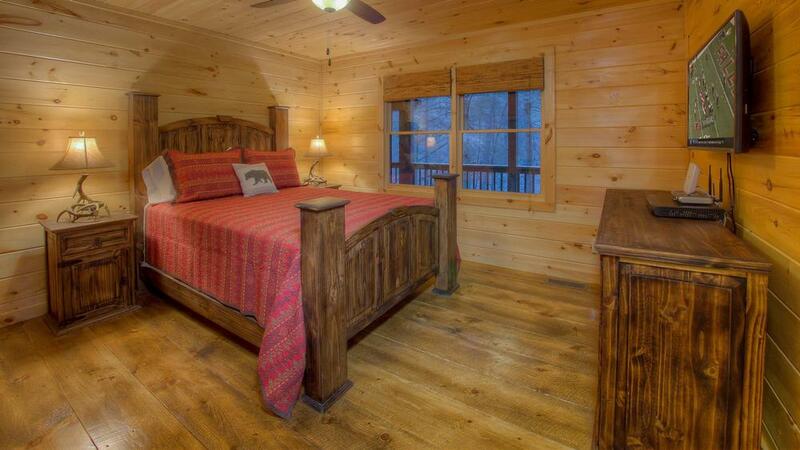 The third bedroom on the main level has a rustic queen wood bed with corresponding furniture and a reading corner with a comfy armchair lit by an antler floor lamp from behind. The adjacent bathroom has an oversized light gray concrete double vanity counter with under-mounted sinks that perfectly complements the silver quartzite tub/shower combo and floors. 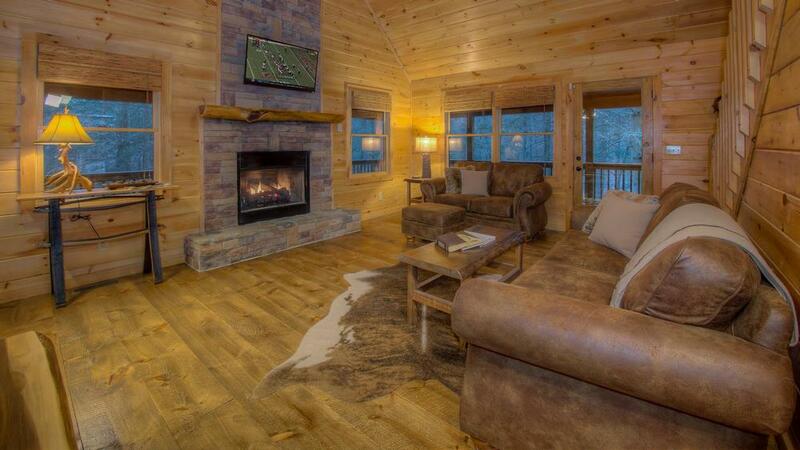 Whether you are lounging around on the decks listening to the rushing waters and chirping birds or unwinding indoors in ultimate comfort and style, River Rush Cabin provides the truly remarkable waterfront experience that memories are made from! Driveway - paved driveway with security camera pointed to driveway when cabin is not in use. Cameras are not active when guests arrive. 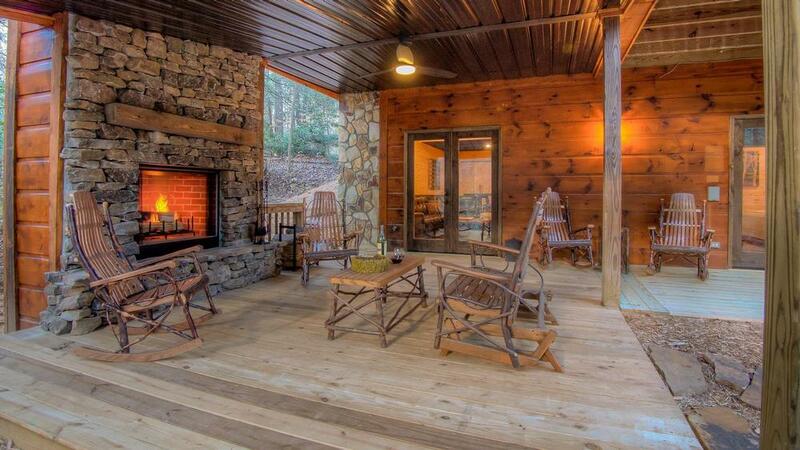 02/19 - Enjoyed the location and outdoor decks; especially the one on the lower level with fireplace. 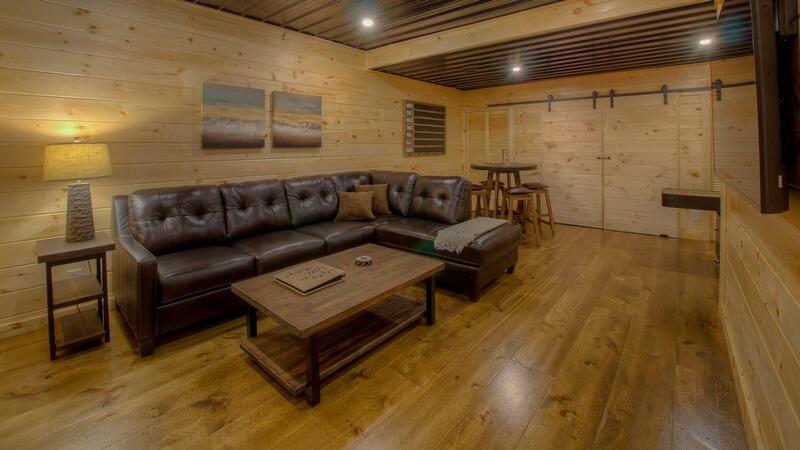 12/18 - The cabin matched the pictures and description. Very impressed with how quickly everyone responded to my questions and how professional and courteous everyone was. 11/18 - Each bedroom on a different level was nice. Kitchen stocked with equipment helpful as well. Alexa was a nice touch. Very professional, quick to respond, great customer service. 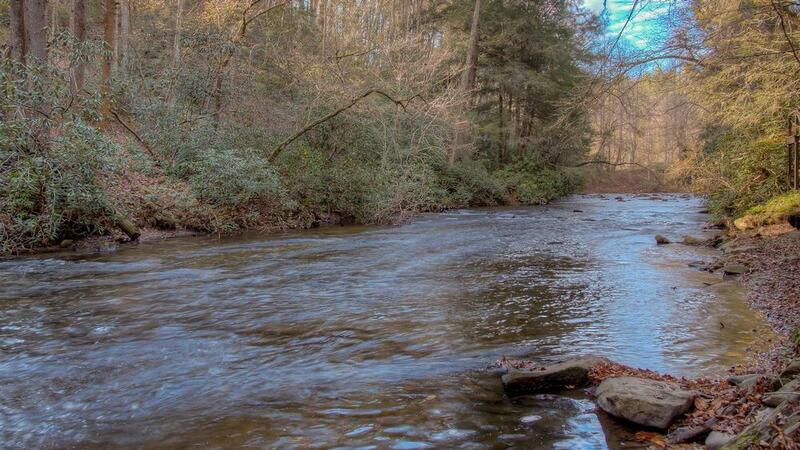 11/18 - The view was fantastic, loved the creek. 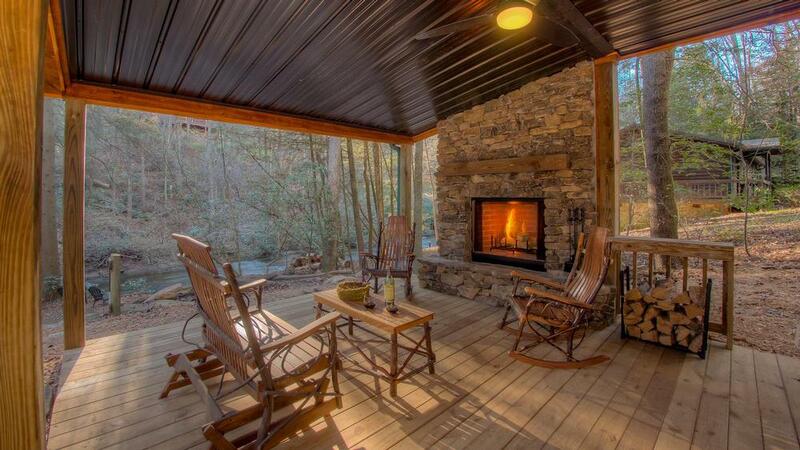 Deck with fireplace wonderful. Rooms and bathrooms nice and large. Always great to work with you guys. 10/18 - So clean and love the river. Denise super helpful and friendly and cleaning staff are A+. 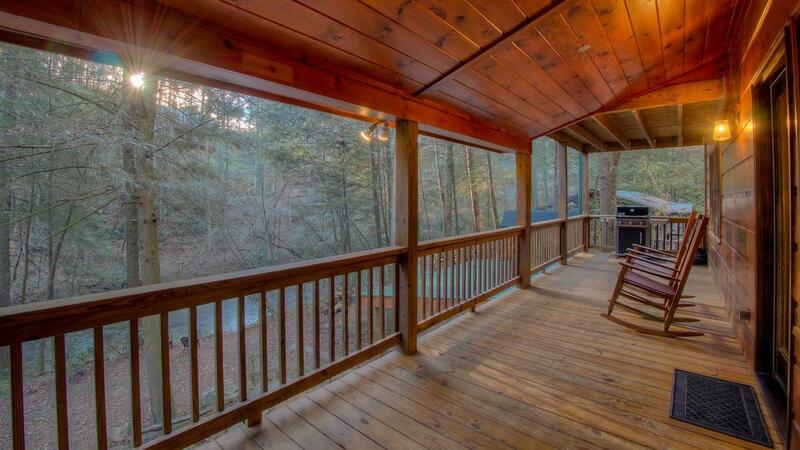 10/18 - Good location, clean cabin, great view. The company is very good to work with. 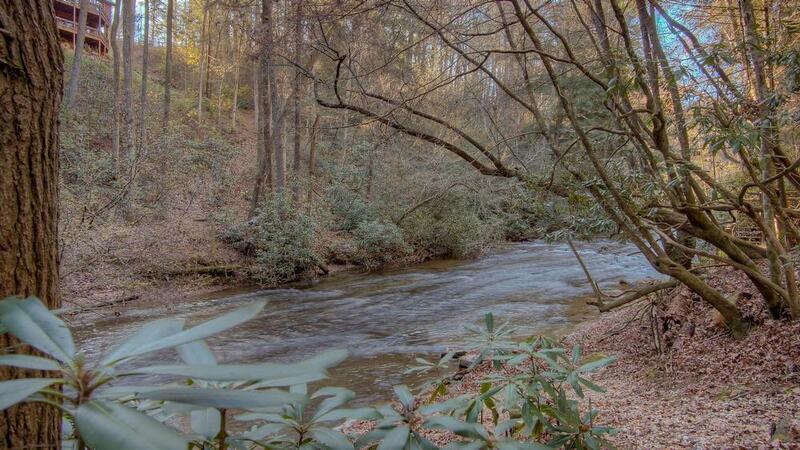 08/18 - Great location directly on the creek! 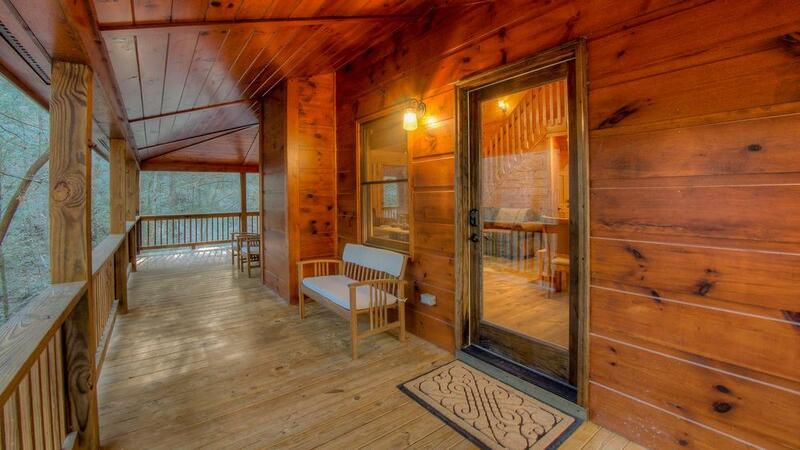 08/18 - We really enjoyed the outdoor fireplace, being on the creek, and the beautiful cabin. The staff are very friendly and professional . 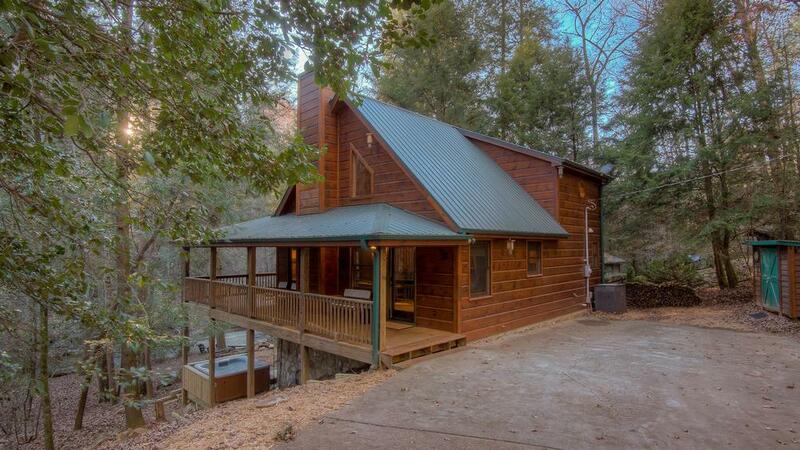 07/18 - The cabin was even more wonderful then I expected. It was on a creek which was so nice to come back to after exploring all day. 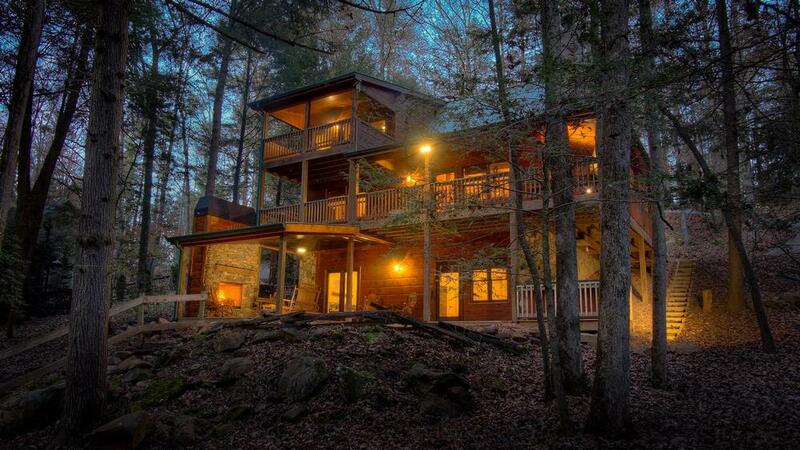 This was our second time using Escape to Blue Ridge and hope to return! Your staff is polite and always so helpful and accommodating! 07/18 - What an amazing place to get away and relax in the mountains!! 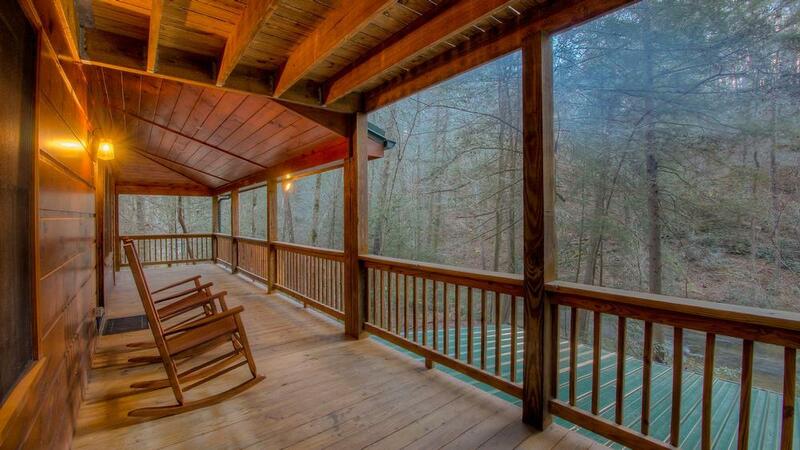 The porches, the hot tub, the superbly equipped kitchen, the comfortable beds, the soothing sounds of the creek. Our experience was overall incredible! Every interaction was very professional and friendly. The cabin was neat, clean and even included a welcome bag!! The towel designs on the beds were a nice touch!! All of the information provided in the cabin was very helpful. 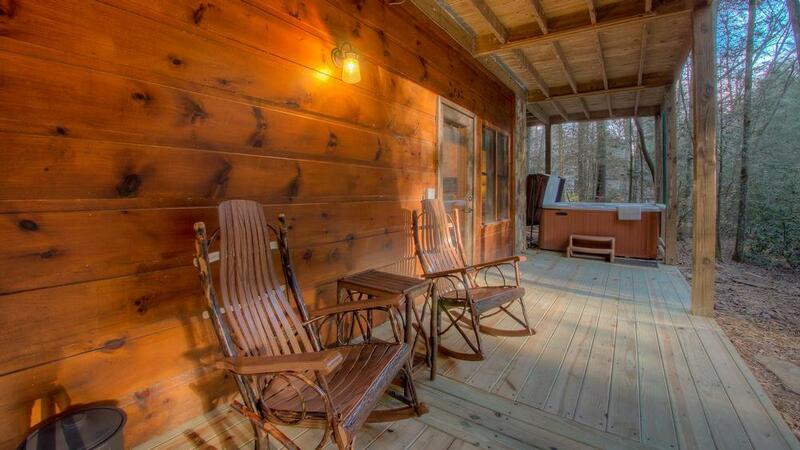 06/18 - Liked the location on the creek, and the amenities.Excellent company! It's my second time renting through you and the service is excellent. 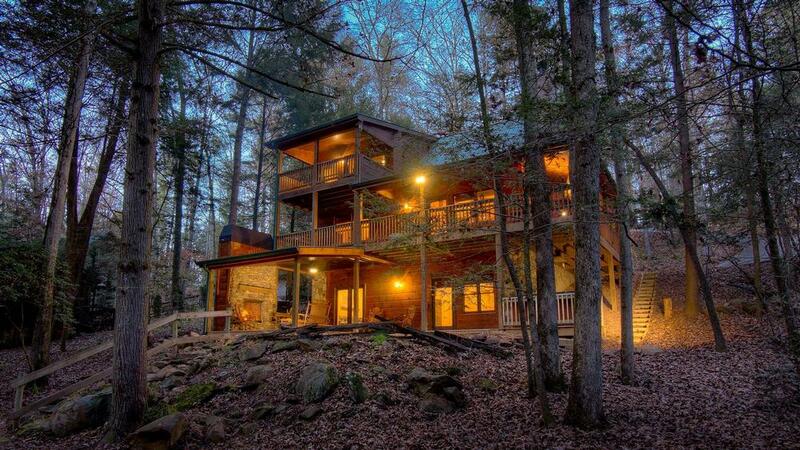 LIke a hotel in the woods! 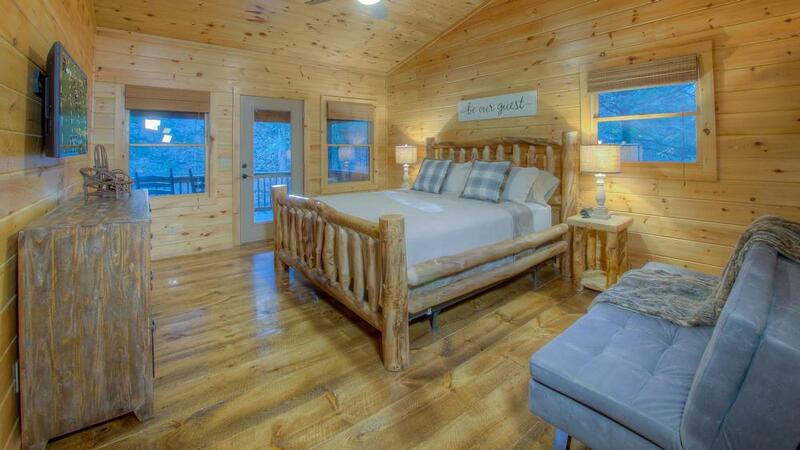 05/18 - Property was well maintained, immaculately clean, and had all of the luxuries to make for a relaxing getaway. Would definitely consider renting property in future. Outstanding across the board. The attentiveness of your staff was unbelievable, no matter how small our issue was...Thanks! 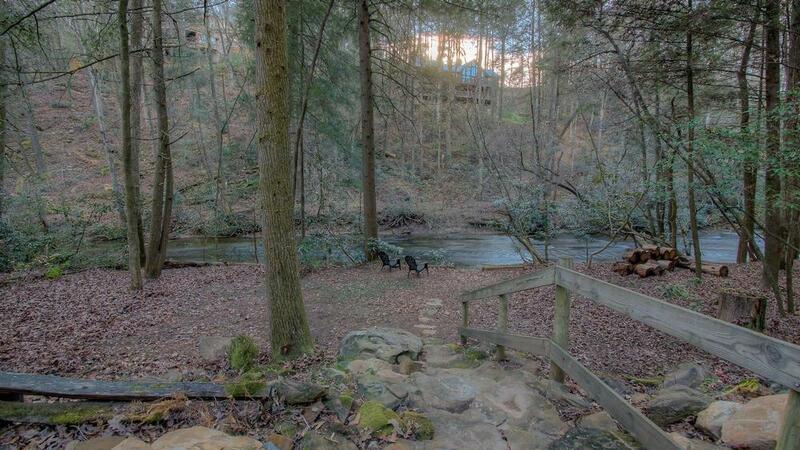 4/18 - Clean, good setting, good location. 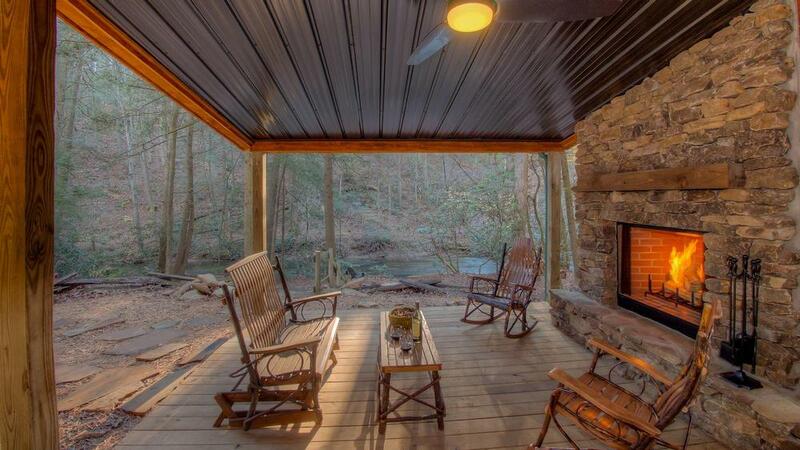 3/18 - Loved the outdoor fireplace right by the river, the decor & the shuffleboard table. 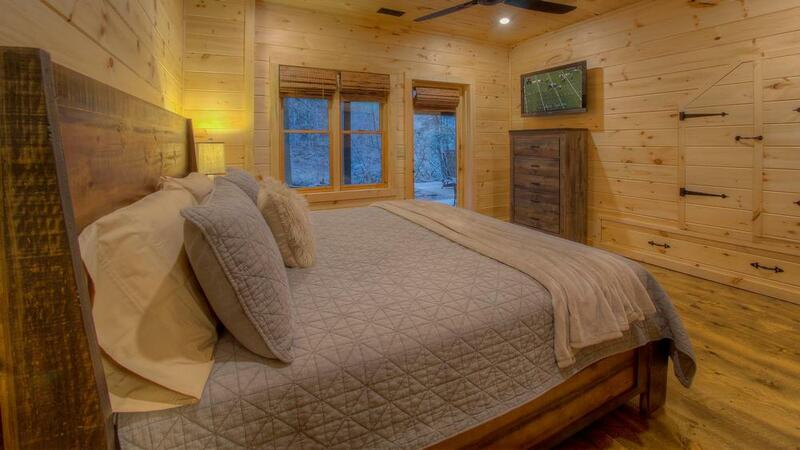 2/18 - The cabin was in great shape and very clean. Awesome location on the water. Great company to work with. 10/18 - Well appointed, great location, lack of difficulty getting down to the water. No problems with Escape to Blue Ridge. 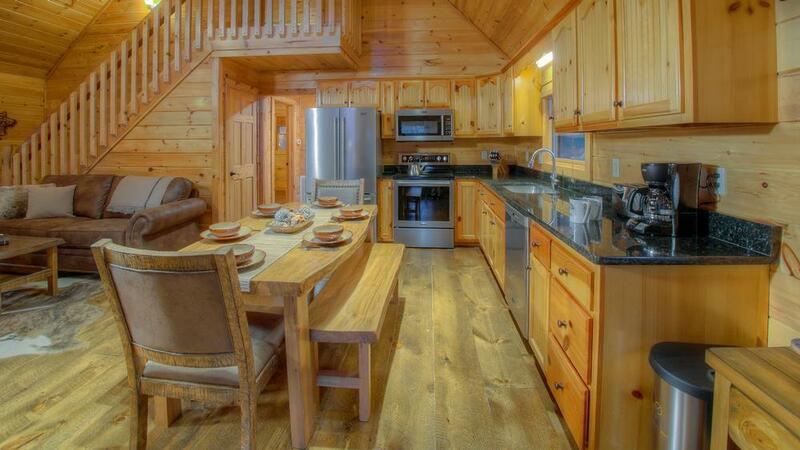 This was my 4th time to rent cabins.